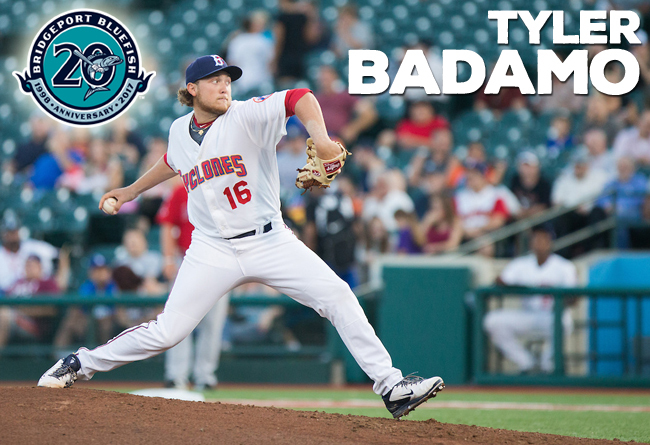 (Bridgeport, Conn., Feb. 7, 2017) – The Bridgeport Bluefish today announced that pitcher Tyler Badamo will join the Bluefish for the 2017 season. Tyler Badamo comes to Bridgeport for his fourth season of professional baseball and first in the Atlantic League. Last year, the pitcher started 13 games with Single-A Columbia (New York Mets) of the South Atlantic League. There, he earned three victories with a 3.92 ERA and 49 strikeouts in 78.0 innings. The 24-year-old made his professional debut in 2014 after being drafted by the New York Mets in the 24th round of the 2014 MLB draft. He has spent his entire career so far with the Mets organization, reaching as high as the Single-A level. In 37 career minor league appearances, Tyler owns a 9-10 record with 141 strikeouts in 190.1 innings of work. Before beginning his professional career, Badamo pitched for Dowling College (N.Y.), an NCAA Division II school in the East Coast Conference. During his senior year at Dowling, he finished with a 9-3 record and a 0.83 ERA. In 108.1 innings across 13 starts, Tyler racked up 129 strikeouts, which was the highest in the nation that year, as well as the highest in Dowling’s history. He also pitched five complete games that season, including two shutouts, as well as 72.2 consecutive innings without allowing an earned run. After this successful campaign, Badamo was named an All-American by Daktronics, ABCA and NCBWA, as well as the ABCA East Region’s Pitcher of the Year.